Order commercial steel doors in nearly any size, core type or configuration. All of our commercial metal doors and frames can be customized to meet nearly any project requirement. We offer both non-rated and fire rated steel doors with vision lite windows, louver inserts, and custom hardware prep. Order from our large selection of quick ship material or tackle the tricky openings with custom hollow metal doors and frames. Our expert level customer support team specializes in supplying commercial doors and hardware that are code compliant, easy to install and under budget. 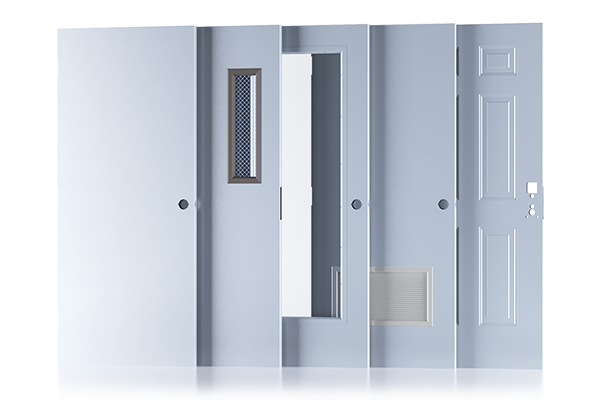 Model 1 full flush hollow metal doors are available to meet or exceed physical performance levels 1 for light commercial use, level 2 for heavy duty applications and level 3 for extra heavy-duty openings. Choose from a wide range of standard options that include embossed panel doors, metal louver doors, steel & glass doors with fire ratings up to 3 hours or hurricane wind load / impact doors approved for use in nearly all coastal jurisdictions. 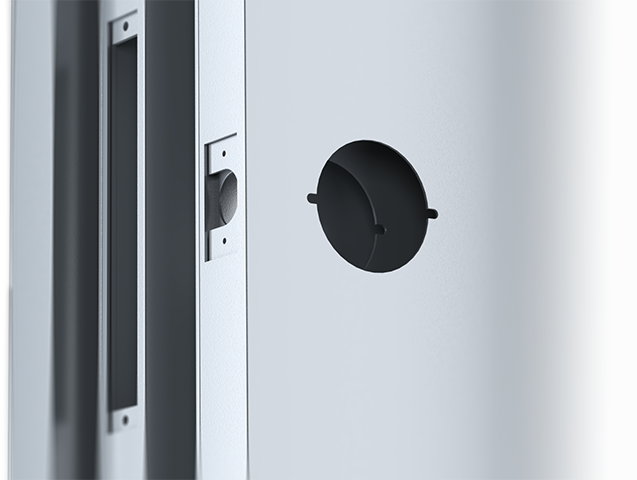 Model 2 seamless hollow metal doors include seamless vertical edges. Seamless edge doors are available to meet or exceed physical performance levels 1-4 which range from a light commercial to a maximum duty designation. 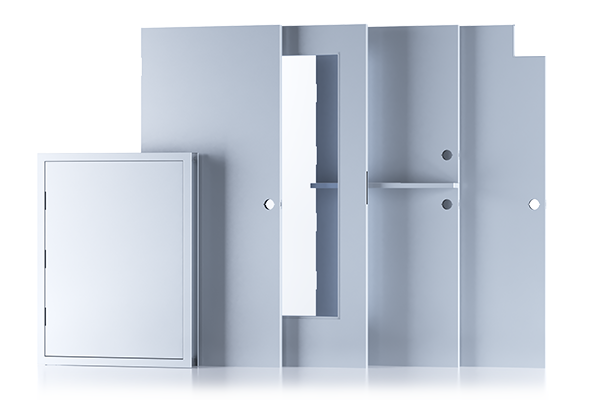 Standard seamless edge doors are available in polystyrene, steel stiffened and temperature rise core options with non-rated to 3 hour fire ratings and hurricane impact / wind-load ratings for use in nearly all applicable regions. We can provide just about any custom hollow metal door as long as it maintains its structural integrity and still meets applicable building codes and manufacturing standards. Order custom sizes, specify any core type, choose your steel type and thickness or add integral lite kits for a more continuous look. 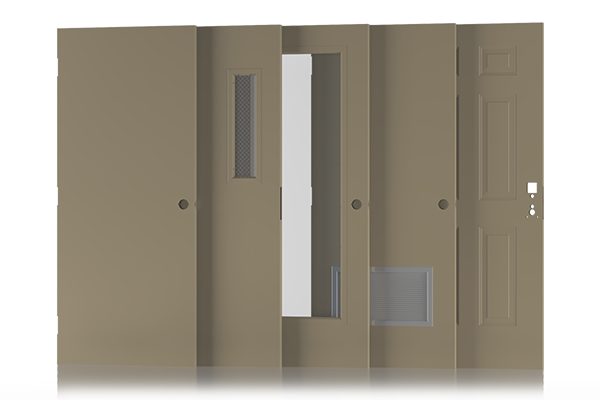 We offer a full range of STC rated doors, blast resistant doors, bullet resistant ballistic doors, lead lined doors, windstorm / impact rated doors and more. Stainless steel doors are often specified for their sleek appearance and resistance to corrosion germs and bacteria. All of our stainless steel doors are made to order and can meet nearly all the same requirements as any of our custom hollow metal doors. Choose your preferred core type, material type, material thickness and finish. Matching stainless steel door frames, louvers and vision lite window frames are available. Steelcraft is known among the world’s most reputable manufacturers of commercial hollow metal door and frame products. Choose from honeycomb, polystyrene, temperature rise, polyurethane and steel stiffened cores in a full range of surface materials and thicknesses from one of the most reputable SDI certified (Steel Door Institute) manufacturers. SDI certification sets the benchmark for craftsmanship, design and durability both in the U.S. and abroad. Full flush commercial steel doors are made from galvanneal / galvanized steel with polystyrene insulated core, interlocking edge seam construction and a flush top. Full flush commercial metal fire rated doors can resist fire for up to 3 hours. All of our hollow metal doors are available with windows inserts, louver inserts, and embossed panels in select sizes. 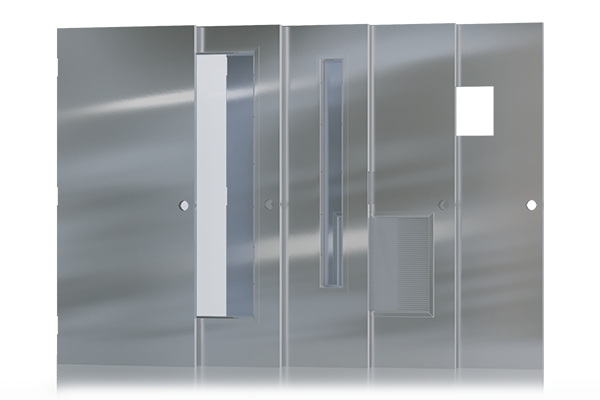 Seamless edge hollow metal doors are available in galvanneal, galvanized or cold rolled steel. We carry seamless hollow metal doors in several core options that include honeycomb, polystyrene, steel stiffened and temperature rise. Most of our seamless edge commercial doors meet or exceed the impact & wind load requirements for use in windstorm and hurricane resistant door applications. Custom hollow metal doors and frames can be manufactured to meet just about any commercial specification. We offer odd commercial door sizes ranging from small access doors to over-sized industrial metal doors in several combinations of steel types and thicknesses. Custom steel doors can be fire rated up to 3 hours depending on sizes and specifications. Stainless steel doors and frames are available in both 304 and 316 alloys with finish options that include #2B mill finish, #4 satin / brushed stainless and #8 mirror finish. Stainless steel doors can be manufactured to meet the same criteria as any of our other commercial steel doors. Steelcraft doors and frames are available in many standard sizes and models. Steelcraft has long been an industry leading manufacturer of hollow metal doors, frames and commercial building materials. Save up to 50% on commercial doors, frames and hardware at USA Fire Door! When choosing a contractor, you always go with the best (and most cost efficient) man for the job. The same concept can be applied when choosing commercial doors. Steel doors are hands down the best for the job. They are far superior to other materials such as wood, aluminum, or fiberglass in terms of performance and longevity. In a swing cycle test, hollow metal doors surpassed wood doors tenfold. Steel doors can last up to ten million cycles of opening and closing. Wood doors failed before reaching one million cycles. As long as steel doors and frames are properly installed, they can last for longer than thirty years! This just goes to show that metal doors are built to last and withstand more than the average daily use. The word “steel” in itself invokes a sense of strength and durability. Commercial steel doors are tough and well constructed. These doors do not crack or dent easily. If a commercial metal door does happen to get damaged, it can often be repaired in the field where other types of commercial doors may require a total replacement of the door and frame. The cost for a repair is much lower than the cost of a total replacement. Not only do these steel doors last, they offer the lowest repair cost, proving to be the best long term value in the commercial door industry. When choosing a commercial door, safety is on the top of the list of what to look for. The door acts as protection against the elements. It has to be able to withstand the abuse from Mother Nature. Once again, steel is the man for the job. Hollow metal doors outrank other materials in terms of safety. Steel is the only material that offers a three-hour fire resistance rating, twice the amount of other materials. This buys more time to escape and extinguish the flames. Not only does steel protect against fire, metal doors are also the safest option for storm protection. Steel is the only material to pass the FEMA 361 tornado test and has the highest hurricane resistance rating. If you reside in an area that is apt to get these storms, steel doors are the best option! Earth, air, fire, or water, steel can stand up to it. Commercial steel doors provide a variety of options to achieve a desired look. 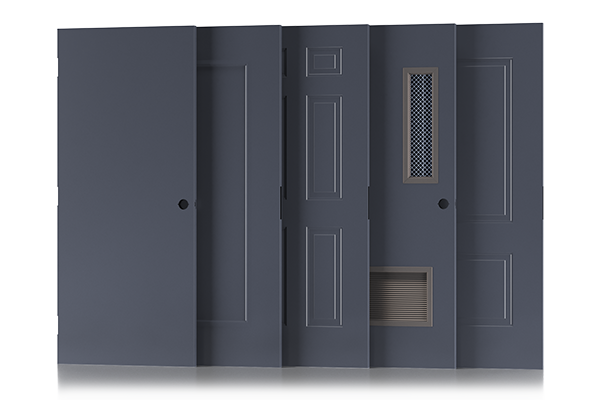 Hollow metal doors can be custom tailored to fit your needs and design preference, however there are many standard options readily available at a lower cost and shorter production time. Stainless steel provides a very sleek and modern look but may be too pricey for a tight budget. If you are looking to add a pop of color and zest to the project, simply adding a nice paint job to a standard metal door may be the best choice. If you want the traditional look of a wood door, but the strength and durability of a steel door, you can choose an embossed panel door to create a more comforting design. Any of these commercial metal door options will be aesthetically pleasing and still maintain code compliance. A commercial steel door does not have to be bland and underwhelming, instead it can be used as a focal design point for any project. On-time delivery, expert level support and finishing under budget is what we do!